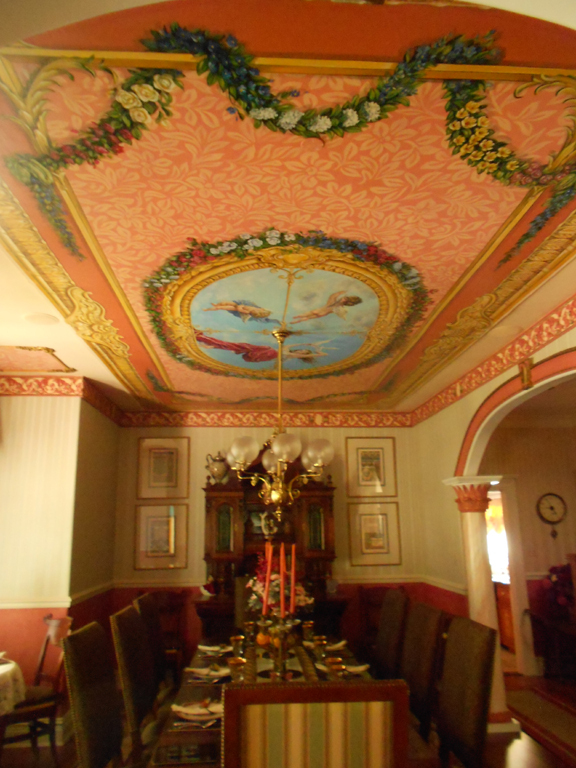 Victorian Ceiling Canvas Mural, before the install. HGTV's "Spice Up My Kitchen"
Hand painted on site for the TV shows new season coming this Spring 2009.
added branches . They actually have an albino squirrel living in their woods. The Woodpecker is a real sculpture. The window was created off site. Pre cut wood panel, was Venetian plastered then hand painted and installed, to keep the texture consistent. The shells, birds and grasses were painted onsite before polishing the plaster. Oil painting , canvas wrapped on 2" deep artist stretcher frames. The Window and Shutters were painted on canvas, then installed. The Faux and Stone, were painted onsite. The right bottom hole is where you open it. Hand Painted hot tub cover to reflect the mural. This was painted onsite. This was an interesting project. the Owners wanted a really fun painting with portraits of themselves, there daughter and dog in it. There are many details that you can not see in the photos, like favorite watches and shoes. Also, they have the most beautiful staircase, made with custom wrought iron work. If you look close to the 2nd photo, you can see it in the background. I duplicated it in my painting, to bring the two rooms together.